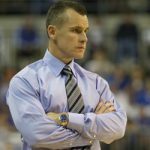 Florida Gators basketball (5-4) broke .500 with a wire-to-wire 75-50 victory over the Texas Southern Tigers (1-7) on Friday evening at the Stephen C. O’Connell Center in Gainesville, Florida. It was over when / significant stretch: Following an 8-0 run by Texas Southern that cut Florida’s lead to 13 with 13:18 remaining, Gators redshirt junior guard Eli Carter banged in a three to kick off an 8-0 response that put UF back ahead by 19 midway through the second half. Florida cruised from there, at one point extending its advantage to 25 points with three minutes to play. Carter only played 14 minutes but finished 2-for-3 with six points and two rebounds. Prominent players: Freshman forward Devin Robinson appears to be putting things together after being a black hole and air-ball gifter through the first seven games of his young career. Robinson scored a career-high 15 points on 5-of-7 shooting, hitting 2-of-3 threes and all three of his free throws. He also added four boards but committed four fouls as well. Sophomore F Chris Walker also shined for Florida, notching 12 points and a career-high four blocks in 16 minutes. Important injury: With just over five minutes remaining in the contest, Robinson rolled his left and went down to the hardwood. He grabbed his lower shin and grimaced but was able to get up and walk off the court under his own power. Robinson returned to play out the final 2:30 of the contest, entering the game with UF leading by 25. First half focus: Florida opened the game by scoring nine-straight points and jumping ahead 16-5 by hitting seven of its first nine shots and both of its attempts from long range. The Gators increased that advantage to 18 on the back of a 13-3 run highlighted by an emphatic dunk by Robinson and took a 17-point lead into the break despite committing seven turnovers in the first 20 minutes. Perfect plays: Early in the second half, sophomore point guard Kasey Hill faked a pass and began to dribble inside the arc only to lift the ball in the air to Walker, who slammed it home to complete the thunderous alley-oop. It was one of Hill’s team-high seven assists on the evening. Walker doubled up his highlight reel in the final seconds of the game, completing an alley-oop with a rim-rocking, exclamation-point dunk to end the contest. Standout stat: The Gators absolutely dominated the Tigers in the paint, outscoring the visitors 48-14 (26-10 at the half) downlow and outrebounding them 34-32. Florida also continued its consistent passing, registering 19 assists on 31 made baskets and even tossing the ball around 14 times on a 35-second possession that resulted in a layup early during the first half. What it means: UF did its job, making quick work of TSU and earning its second decisive win of the week. 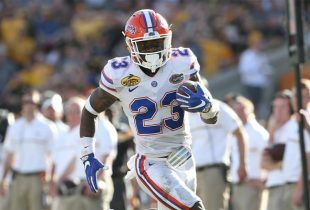 The Gators have done plenty to improve their confidence over this five-day stretch and should enter the end of their non-conference schedule with some positive momentum. Next up: Florida will end its three-game homestand on Sunday when it hosts Jacksonville at 4 p.m. UF will then get a six-day break before taking on Wake Forest as part of the 2014 Orange Bowl Basketball Classic in Sunrise, Florida, on Dec. 20. I’m starting to become a believer in Walker. He’s still very raw without much natural “basketball” smoothness but he’s a running & jumping athletic freak who’s getting better every week. Robinson is similar with even more basketball ability who’s also getting better every week. Granted, it was Texas Southern but I’m liking this team’s potential. I still think Hill needs to be more assertive offensively & has the ability to do so. Go Gators! Love this theam already. They are buying in, and Billy D has them on the path he wants. The injuries will be a blessing come money time. The potential is insane, but they have to take their lumps. Be patient Gator fans, but be very pleased at the same time. Possible? Heck of a game for Robinson and Walker. I was beginning to think that even if Walker is a first round pick he would do much better in college for 1 more year, and I am still not sure that wouldn’t be the case. Even though he seems to be breaking out the last couple of games, they have been against much lighter competition, so it will be very interesting to see his progression as the season continues.